Scrutiny: #BiggBoss8 Day 75 Synopsis:Stop Shop and Roll! It’s Day 75 in the Bigg Boss house, the day to select a new Captain! Pritam is instructed to inform the housemates about the launch of the captaincy task. The task requires the housemates to decide on one contender mutually while the other names will be of Pritam’s choice. Pritam selects himself to compete against the contender selected by the other housemates. All the housemates look alarmed at Pritam’s decision but do not react in front of him as it is his right as a captain to choose whoever he seems fit. Later in the day Bigg-Boss announces a very interesting luxury budget task in which two housemates will get a chance to go shopping! Gautam and Sonali are chosen for the task and get a chance to go to a mall in a brand new Maruti Suzuki Swift. Sonali’s happiness knows no bounds while Gautam looks a little stressed. Other housemates look disappointed for not getting a chance to participate in this task. However they do not react. Gautam and Sonali arrive at the mall where they are required to buy the luxury food items with a twist. They will need to convince the common people inside the supermarket to pay for the items they want to purchase for the house. Within 15 minutes each to buy as many things as they can. Gautam and Sonali look nervous but are ready to take up this challenge. Gautam being a charmer manages to buy most of the items while Sonali takes her time to finish the task. 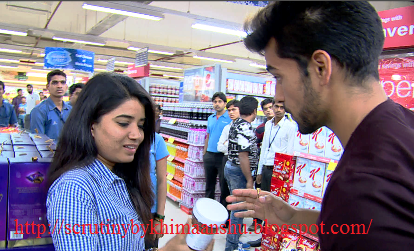 On their return the rather excited and curious housemates gather around them to know their shopping experience.. Gautam and Sonali are more than happy to narrate the whole task and also share the chocolates, wafers and other items they have managed to get for everyone. Must say, after waiting for two hard weeks housemates finally get their luxury budget in style putting a big smile on everyone’s face. Tune into tonight’s episode to get the entire scoop on who became the new captain of the house and what else the housemates have to offer to add on to the entertainment.